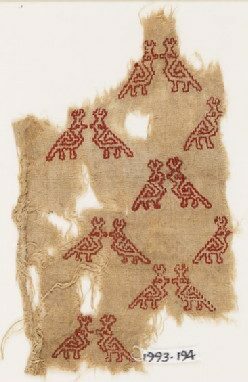 This textile is plain tabby woven linen, 11.5 cm by 7.8cm and embroidered in red silk. 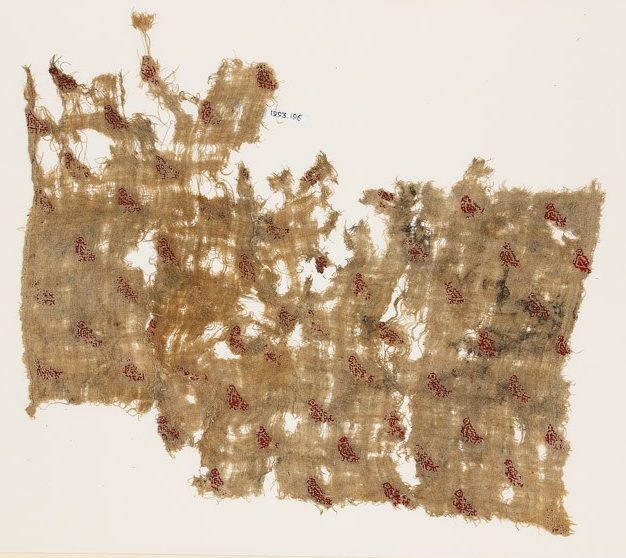 The textile was thought to have been made between the 10th-15th century C.E and found in Egypt. 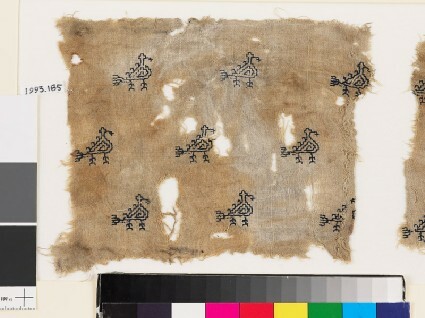 Currently the textile can be found in the Ashmolean Museum Accession number EA1993.193. I have charted up the design & is available for download in pdf format. This textile is also plain woven linen embroidered with red silk, 10th-15th century C.E. found in Egypt. The size is 43 cm by 47 cm. However, there is a selvedge on the left hand side of the textile. It is currently in the Ashmolean Museum Accession number EA1993.195. I have charted up the embroidery design. It is available for download as a pdf. 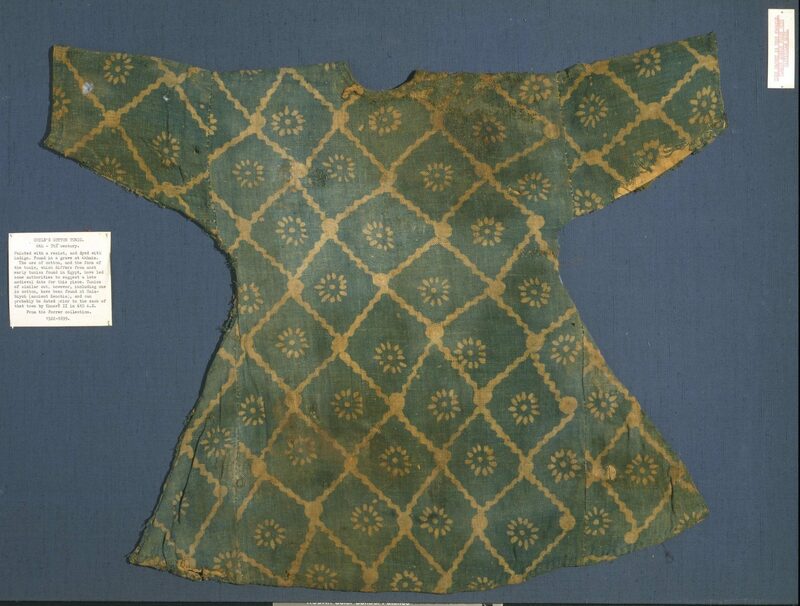 This textile is also plain woven linen embroidered with silk (blue), 10th-15th century C.E. from Egypt. It is 21 cm by 17 cm with a crude seam on the right side of the textile, sewn with flax. The textile is in the Ashmolean Museum Accession number EA1993.185. 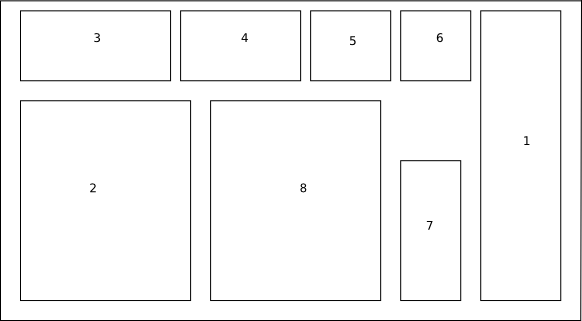 I have charted up the design and it is available for download in pdf format. 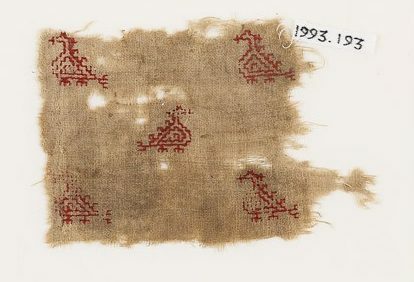 This textile is like the previous- plain woven linen embroidered with red silk, made between the 10th-15th century C.E in Egypt. The size is 18 cm by 11.7 cm with a rolled hem in flax on the left side of the textile. It is currently in the Ashmolean Museum Accession number EA1993.194. The chart is available as pdf to download. Please let me know how the charts go! For more information on bird symbolism please read Birds in Islamic Culture (blog), The Conference of the Birds, and The Simurgh. This entry was posted in Uncategorized and tagged Ayyubid, blackwork, challenge, chart, Egypt, embroidery, Fatimid, garb, Mamluk, textiles.